Style W89 AGS rigid couplings are designed for use with HVAC and industrial pipe installation to provide an inflexible joint. They reduce linear and angular movement through the use of wedge-shaped coupling housing keys, which fully engage the grooves to provide rigidity on valve connections and other points where inflexibility are necessary. 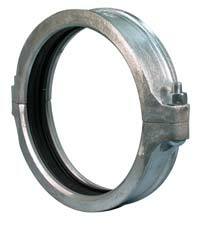 Available in sizes 14–24 inches, they are provided with plated bolts and nuts and FlushSeal gasket Grade E EPDM for multiple uses. Grade T nitrile and Grade L silicone also are available. Suitable for use on stainless-steel piping where the corrosion resistant properties of stainless steel are not required for the external environment, they are available in standard galvanized steel or painted.